3) proper citation - GPS. Visit here frequently. a3Genealogy contracts researchers as needed for local/onsite repository research at courthouses, churches, and other local repositories. Each researcher will be issued a Job Description that must be signed and returned upon accepting job. We have in office assistance should researcher need administrative assistance, or if we can help you be successful with research projects. 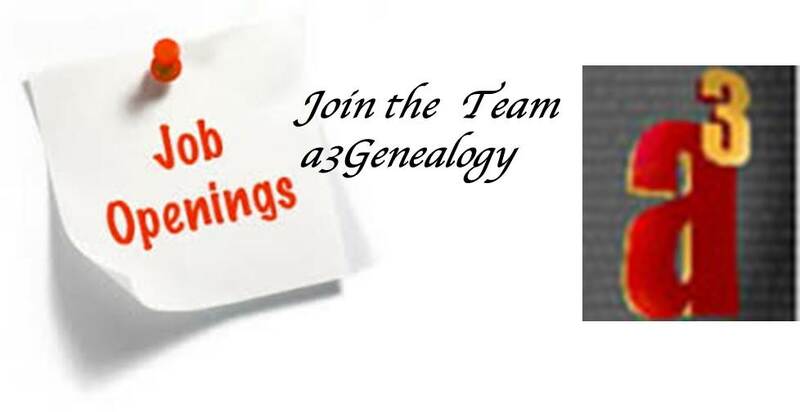 In addition to a signed Job Description (Agreement), the a3Genealogy Privacy Act Statement must be agreed upon. Know that we comply with the Federal Tax Laws set for 1099 consultants and will request the completion of W9 in order to comply. For qualified researchers, a3Genealogy offers $150.00 vouchers toward Professional Development. Pay based on proven level of expertise. Always submit your hourly rate when applying and a copy of a non-published final report.